The Vatican has quickly denied the apparent dramatic theological shift, accusing the reporter Eugenio Scalfari of 'reconstructing' the Pope’s words. Is God angry or happy with Pope Francis for denying that hell fire exists? No one is really sure. But hours after the Pope was quoted in an interview as saying that hell fire does not exist, and the Vatican denying that the pope said so, but was only misquoted, ceiling plasters rained down from St. Peters Basilica during worship on Thursday. Could this be a sign that the pope is right or wrong? No one can tell for certain at the moment. Daily Mail UK reports that bits of the ceiling rained down over worshippers near Michelangelo's famed Pieta statue to the right of the main entrance. No one was, however injured. A Vatican spokesman said the basilica remains open with the affected areas sealed off until later on Frday. It comes after the Pope was sensationally quoted as saying that hell does not exist and souls not worthy of heaven merely disappear instead of being tormented. 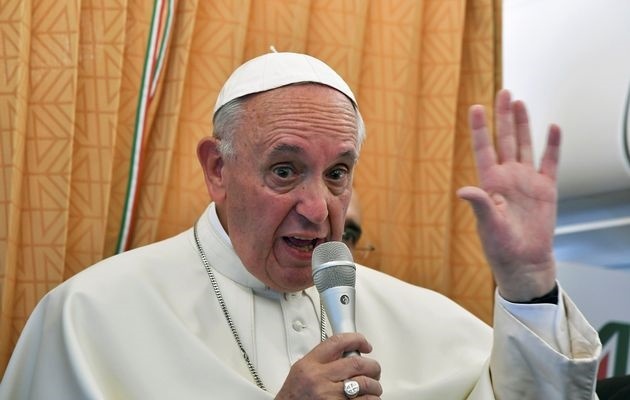 But the Vatican quickly denied the apparent dramatic theological shift, accusing the reporter Eugenio Scalfari of 'reconstructing' the Pope’s words. Catholic teaching dictates that 'immediately after death the souls of those who die in a state of mortal sin descend into hell', the Vatican maintained.